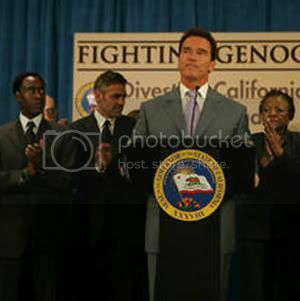 On Monday, September 25th, 2006 California Governor Schwarzenegger signed two bills that prohibit the state’s pension funds from investing in companies with active business in Sudan, hoping to help convince other states to do the same. Ultimately, it is to pressure the Arab-dominated government of Sudan, which is blamed for the deaths of at least 200,000 non-Arabs since 2003 and the displacement of more than 2.5 million people in the nation’s western Darfur region. Don Cheadle added that he wanted to make clear that although he and Clooney had personally phoned Arnold weeks ago upon hearing that the Bills were in danger of veto, the pressure they’d hoped to exert proved unnecessary. The Governor has apparently been a supporter and believer in this bill since it’s conception. In the 1980s, the state approved similar measures to allow state entities to divest in South Africa in order to protest its apartheid policies.